This is what mercy means. At the end of last August – before summer’s harvest gave up for good, before an inkling of our daughters had yet twinkled into being – an invitation arrived. Would I write a book on mercy? A small one, short and Scripture-dense, to break open the Word and the God-trait that was the year’s focus (for all things Catholic)? Yes, of course. An invitation to write, a chance to settle into Scripture, a timely theme. These are a few of my favorite things. And I thought I knew a thing or two about mercy. Or at least I had the right books on the dusty shelves from enough years of theology to learn what I needed to know. I thought I could say something. I wrote the book on weekends last fall. Stuck lying on the couch with morning sickness, rising only to search out another book or stumble to the bathroom to be sick. My stomach swelled as the twins grew, two babies who were not even faint blips on the radar when I said yes to writing. It would be fine, I decided. I could still write, even under pregnancy’s strain. Morning sickness was a familiar companion, even with the unexpected anxiety that came from twins. I knew enough to finish the task. It was a short book, after all. I could see the project through. Besides, I thought – as I rested book or Bible or journal on the mound of my growing belly – I could tell the babies about this someday. Tell them how I wrote this little book while they were tiny within me, kicking and jostling each other for space. Smile at how these wee ones were my writing companions, even before they saw the light of day. It could still be good. I finished the manuscript in January. Everything unraveled in February. Everything I thought I knew. Page proofs arrived in March, a week after the twins died. Somehow I edited in April; I have no memory of this. The editor was an angel; she sent more prayers than queries. Bowed low with grief, I tried to think that it could be still beautiful, that I had written the little book while Maggie and Abby were alive and within me. I hoped the words still said something good about mercy. Even though everything I believed about God was now turned inside out. The package arrived this week, quietly on our doorstep. Inside were shiny covers, smooth pages, slender but solid. A finished work. I flipped through the pages and tried to feel something, anything. The book did not feel like the baby I held when my first book was in my hands. Because this was not my baby. My babies were gone. I looked at the list again. Seven bodily, seven spiritual. And then I realized: this is what mercy means. Because this year was not about me saying something about mercy, or writing something about mercy, or doing anything about mercy. It was about receiving mercy. Every day of this godforsaken, God-filled year has been drenched in mercy. Feed the hungry. Visit the sick. Bury the dead. Counsel the doubtful. Comfort the sorrowful. Pray for the living and the dead. People did this for me, for my babies, for my family, all year long. They were mercy to us. They sent tin-foiled casseroles and fresh-baked bread and restaurant gift cards from across the country. They visited us with armfuls of flowers and sat with me crying on the couch when I was too weak to walk upstairs. They turned out in droves for a funeral for two babies they never got to see or hold. They listened to my grief for hours and read pages of it here. They texted and called and hugged and comforted my sorrow. They prayed and prayed and prayed, while the girls were living and while they were dying and every single day since. Mercy was not what I studied or wrote this year. It was what I lived. Because it was not about me. It was about all of you. This is the part where the author should tell you where to buy the book, how to use it by yourself or with your Bible study, where you can learn more from the publisher. But that is not the part I want you to know. What I want you to know about mercy is this: it is torrents of grace when you least believe it exists. It is human goodness poured out so thick you realize it must be of God. It is concrete compassion, cooked in food and wrapped in gifts and spoken in words and lifted in prayers and soaked in love, so much love when your aching body and worn-out soul crave it to survive. You were mercy to me. Every one of you who read my words, who shared your own, who prayed for perfect strangers you have never met. 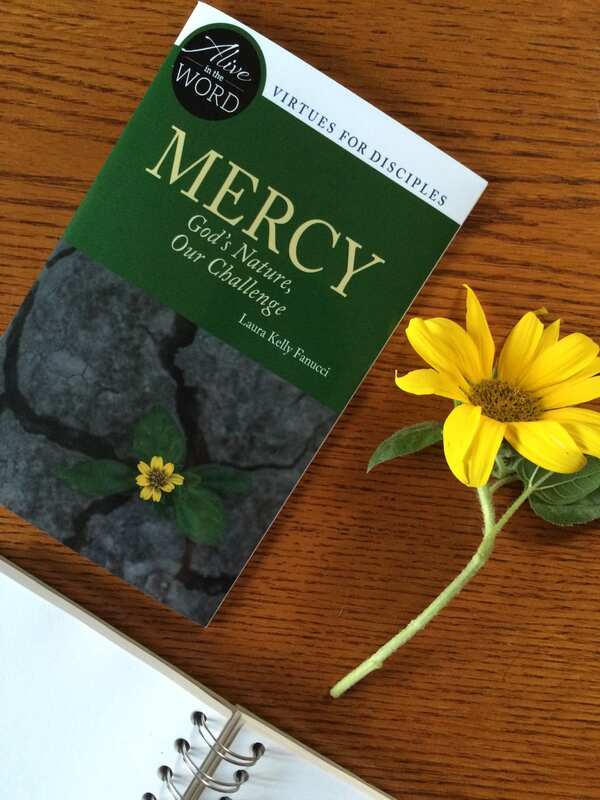 The irony is thick: I don’t know if I understood mercy until after this book was finished. But the months I spent with mercy on my mind – and Maggie and Abby safe within my womb – convinced me that this love at the heart of God could be the most important attribute of all. Mercy is pure love. Undeserved compassion. Shared suffering. Tender transformation. It is the gift that makes God divine. It is the challenge that pushes us to become the best of what is human. You taught me what mercy means. I will never forget it. Laura you taught us what mercy is we feel it in the honest cries of your heart and through your writing. Still lifting you up in prayers and love. My beloved friend. It’s been so emotional and raw and painful being with you in this grief. It has also been beautiful and transcendent and joyful. Thank you. This was a beautiful, beautiful insightful blog post. Laura, your strength and raw honesty are gifts to the rest of us. You have the ability to drive others forward when they are drowning in their own sorrow. You just taught me what “mercy” is, and for that I thank you. I hope I get to see you soon. Maybe the writers group on August 13??? Until I can hold and hug you in person, know I carry you in my heart and thoughts. The wisdom you share from the depths of your losses is a gift to others in your life. How very poignant and beautiful. Thank you so much for this post. You will be in my prayers. I am still processing the give and take that is mercy. I can’t put it into words yet, but your words are helping show me the way. Hugs and prayers, fellow traveller!